While I normally would install my power supply first, I decided the NZXT H200i required a few more fans for intake at the front. Thus, I used two of my NZXT Aer F140 fans, which I thought would fit well in this case. With the removable fan bracket, the two fans were quite easy to install, though I accidentally placed them with the cables on the opposite side. After some rearrangement, I placed the frame back on the front panel and covered it with the included plastic mesh filter. As we have already mentioned, you could either put a 240mm radiator or two smaller 120mm fans in this area if you so desire. Afterwards, I continued on with the rest of the installation. Next, I routed the power cables for the GAMDIAS ASTRAPE P1-750G 750W and I placed the power supply in. I was originally going to use my SFX power supply, but the cables included with the unit were too short for this case. Thus, I had to remove the extra bracket before installing the ATX-sized GAMDIAS unit. I routed these cables up the back side for the CPU and through the side for the motherboard and graphics card. This step is important to do ahead of time, as these routing holes may become more obstructed as you start installing more components. At the back, I also installed my two 2.5" SSDs to the bracket, which were the Patriot Ignite 480GB and the Gigabyte UD PRO 256GB. With the cables in place, I mounted and installed my mini ITX system. This includes the Gigabyte GA-Z170N-Gaming 5 mini ITX motherboard with an Intel Core i5-6600K mounted under a CRYORIG C7. The CRYORIG C7 is a pretty low profile cooler overall, but the H200i has more than enough room, with compatibility of CPU coolers up to 165mm in height. 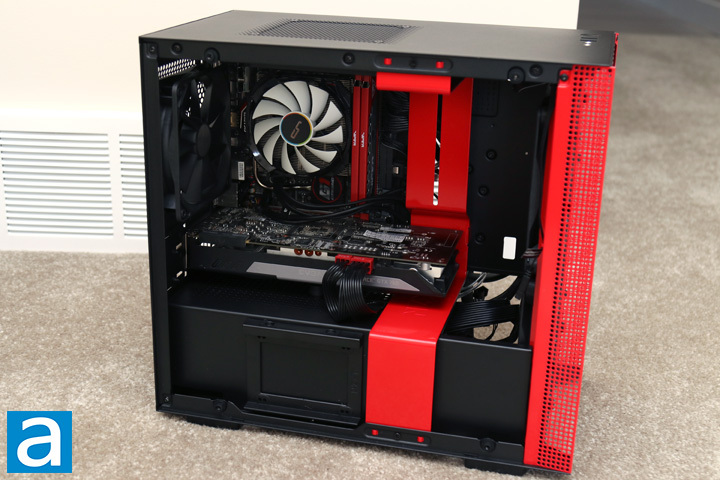 Once again, top mounted liquid cooling options are limited to 120mm. Two sticks of Patriot Viper Elite 2x8GB DDR4 memory are also mounted to the motherboard. I also installed my EVGA GeForce GTX 760 into the single PCI Express slot on the motherboard. One neat thing NZXT has included with their case is a small little nub that fits into the holes above the power supply shroud. 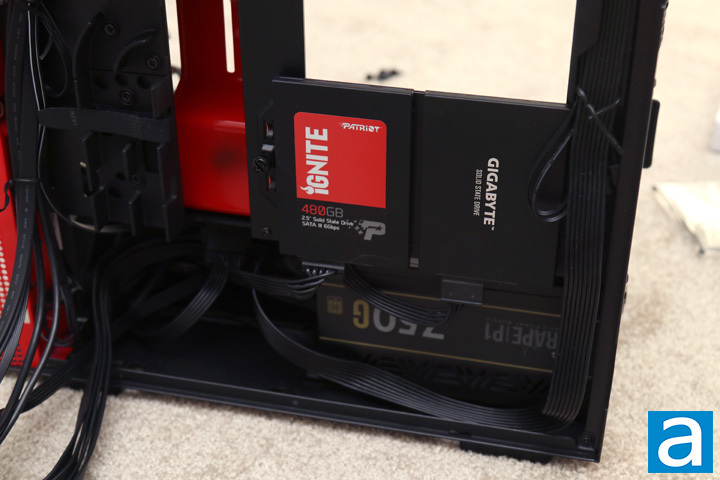 With this small height, it lifts any installed graphics card up to help with preventing any sag, while also keeping enough clearance for some air to pass in or out. I think this design is quite ingenious as it is quite minimal and still accomplishes the same goal. Finally, I plugged in all of the internal connectors, such as the front USB 3.0 header and the HD audio pins. I also want to compliment NZXT here for doing something most case manufacturers have ignored. Typically, the power switch, power LED, HDD activity, and reset switch are all on their individual lines and users have to install them one by one. However, the H200i combines all of the smaller I/O pins into one header, so users only need to plug that one in. I know it seems like a pretty small thing, but it is by far one of the most annoying things to have to install, so a big thank you to NZXT for making this happen. 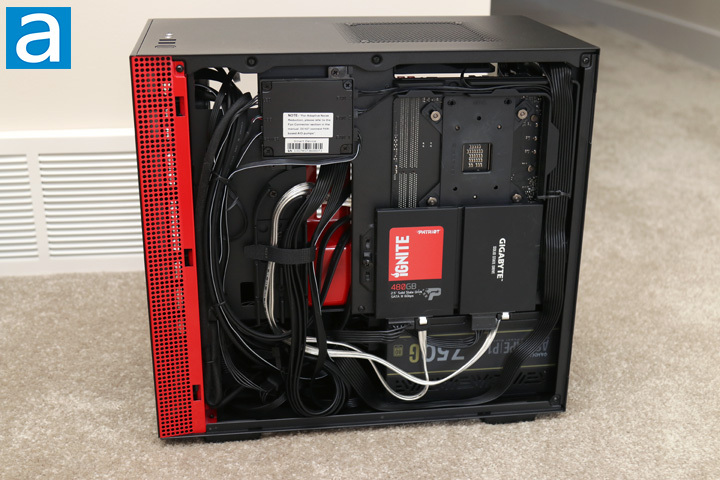 With all of the SATA connections finally plugged in and everything cabled in place, here is a look at the back. As you can see, the plastic rails guide cables up and into the front area, while one more at the back is used to hold the CPU cable in place. Despite the low clearance number on paper, I did not find the H200i to be a struggle to really use. To be fair, I also used the bottom basement for any extra cabling, especially as I did not install any 3.5" drive there. 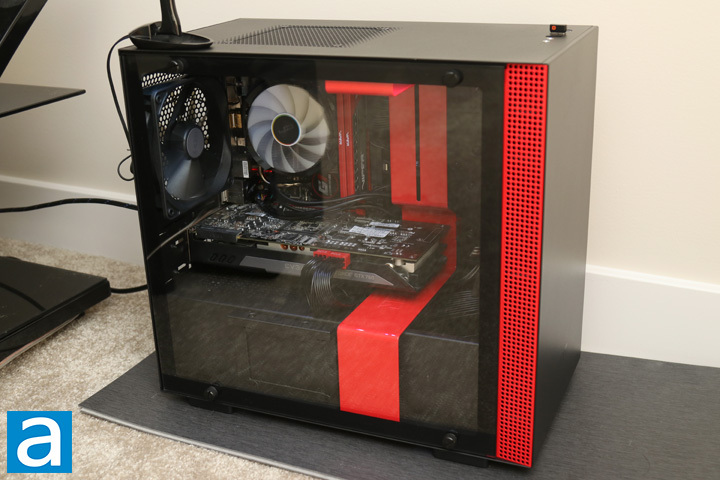 Even so, I think NZXT could increase the width of the case overall to allow for a bit more clearance here. Overall, installation was a breeze and NZXT should be happy with what they accomplished here, as well as on their other H-series cases. The CAM-powered Smart Device controller module, which controls all the lighting and fans inside the NZXT H200i, requires you to install NZXT's CAM software to operate. We have covered the CAM software multiple times before, so I will not go over it for too much. Specific to the H200i, I used the utility to change the lighting of the included single LED strip and to calibrate the fan profiles. I found the calibration process to be pretty straightforward with the latest version of CAM, as it took me through a three step process of just clicking buttons and letting it do its work. In addition, if you just want to manually change the fan curves, you can still do this with CAM, which allows you to change individual settings for up to three channels of fans. 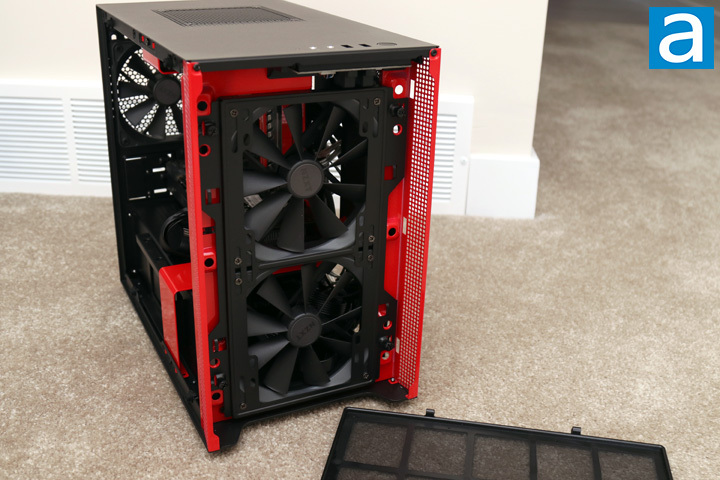 You can read my other impressions of CAM in my other reviews, including the CRYORIG H7 Quad Lumi and NZXT HUE+, though these were tested with older versions of CAM. 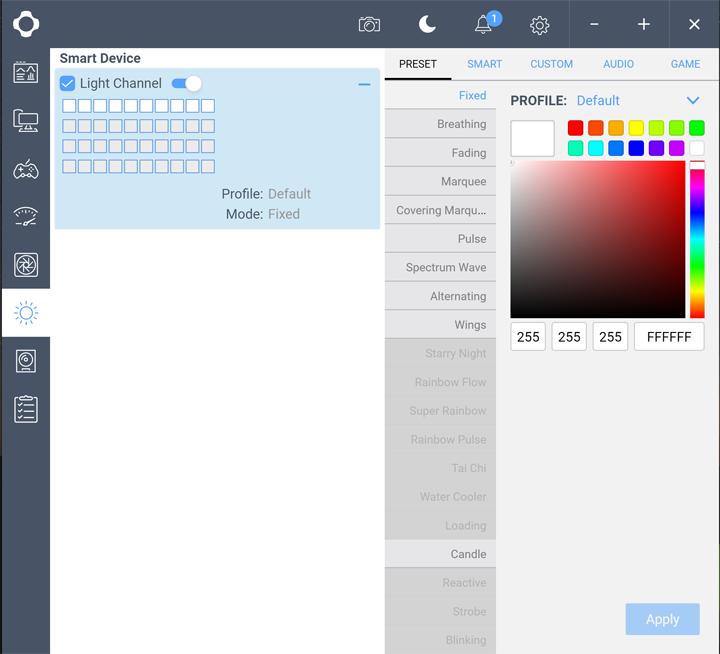 I still do not love the fact CAM requires you to be always connected for the software to work as there is no reason for it, but otherwise the software utility works well. With everything plugged in, I fired up my machine, and it whirred to life. As for the sound output, I used NZXT's CAM software to help with optimizing the fan speeds, though I found the preset settings to be good enough. According to the standard APH Networks sound scale, where 0 is silence and 10 is loud, the NZXT H200i is a 4.5/10 under load, while a quieter 2.0/10 in lower load situations. I took these listening measurements while I disabled the two fans I installed personally, only marking it based on the pre-installed fans. Overall, these fans are quiet enough for day to day use, though I would have liked to see them still use fans with fluid dynamic bearings for a longer life span. Since returning from our trip, people have asked me what I ended up doing in Yellowknife. We saw many great things, met new friends, and ate good food. All in all, the trip was made special because of people I traveled with and not just the places we went. However, I can say it was still a great place to visit. As for the NZXT H200i, I will turn your questions around and ask, "Why are you not getting one?” Picking up exactly where the H700i left off, we have the same clean design and excellent build quality. The steel panels and tempered glass are sturdy and classy, making for a clean and eye-catching case. Its smaller motherboard specification does not translate into sacrificing component compatibility with ample spacing internally to also allow for good airflow. Features to support various power supply sizes and prevent graphics card sag are just some of the examples of their intelligent design choices. Installation is made easy with the plastic guides for cabling, the metal bar to hide extra cables, and the single plug for all the front connectors. The CAM software also does its job to add lights and control fan curves. Even so, this case does have some small things I would improve upon. For one, the included case fans have a shorter lifespan with its cheaper bearings compared to the retail Aer fans, despite sharing the same name. I also really want front panel USB Type-C ports here. This is a standard for 2018 and should not be omitted on any flagship case. With all this in mind, I am still extremely happy with the NZXT H200i. At press time, you can find the H200i for around $110 USD, but you can also find the non-i version for twenty dollars cheaper. There is no reason to doubt the NZXT H200i, as it is one of the best options currently available for this form factor. The H200i may be the smallest H-series case, but NZXT still delivered a product with a superb design and matching feature set. 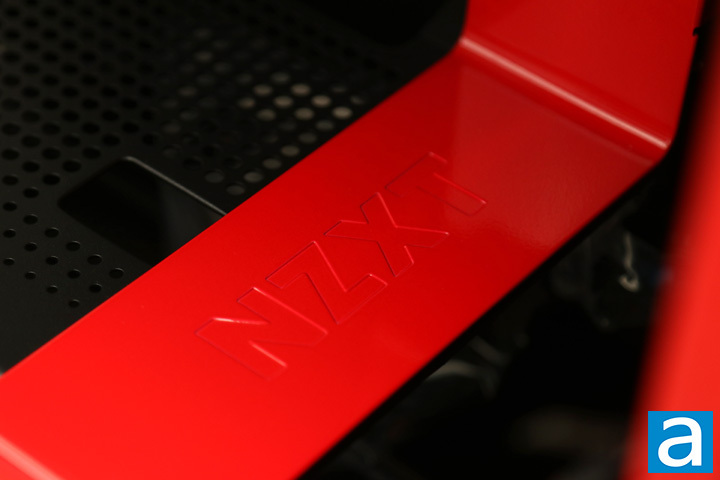 Do you have any comments or questions about the NZXT H200i? Drop by our Forums. Registration is free, and it only takes a minute!